At Van Sant Law,, we recognize how dangerous other drivers can make the roads for motorcyclists. In 2012 alone, there were 134 fatal motorcycle accidents in Georgia. Despite actions to make the road safer for motorcyclists, this number has been similar for the five years preceding 2012 and the pattern does not look like it is changing. This may seem like a small number, but when compared to the proportion of car accidents that are fatal, it is clear that motorcycle accidents can be devastating for those involved, especially when the accident occurred due to no fault of the motorcyclist. 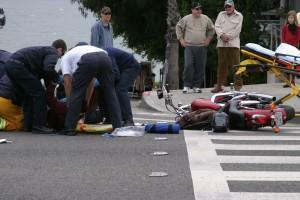 Even when motorcycle accidents are not fatal, the damage done can be severe. A motorcycle crash can cause a motorcycle driver to collide with both the other automobile and the road. This not only intensifies their injuries, but can also cause new injuries after the original impact. Crush injuries, traumatic brain injuries, broken bones, spinal cord injuries, lacerations, and other injuries can leave the victim in dire need of immediate help. A front-end collision with another vehicle: This is common in cases where a car turns left unexpectedly in front of a motorcyclist or a car opens its door in front of an oncoming motorcycle. A left-side collision with another vehicle: This is common in cases where a car merges into a motorcycle. A right-side collision with another vehicle: This is common in cases where another car changes lanes into a motorcycle. A rear-end collision with another vehicle: This is common in cases where a car does not stop in enough time at a crosswalk or stoplight, or when riding in groups with inexperienced motorcyclists. A collision with a fixed object: This is common in cases where a motorcycle has to swerve to avoid another car or in inclement weather. In most motorcycle accidents that injure motorcyclists, the other driver is at fault. Drivers fail to check blind spots, they turn or change lanes without signaling, or they are generally negligent in traffic. Despite utmost caution practiced by motorcycle drivers, it can still be possible to be seriously injured by the actions of another driver. Even in cases where a motorcyclist hits a building, tree, or another object, it can still be the fault of another driver. When a motorcyclist has to use evasive maneuvers to avoid another driver who is being negligent, he or she can lose control of the bike. Often an accident with another driver can be avoided by the quick actions of a motorcyclist, but that does not always mean that he or she will avoid injury. A motorcyclist should not be held responsible for accidents in this type of situation, and he or she may be due compensation from the responsible party. It is more difficult to prove a motorcycle driver was not at fault for a collision with a fixed object. This is especially true when the other driver does not stop or if the accident was caused because the motorcycle driver suffered a medical emergency while on the bike and lost control. Motorcyclists should not have to pay for damages caused by situations they have no control over. That is why it is important to get help from a professional to document the case. If you or someone you love was the victim of a motorcycle accident, you should get in touch with our expert Georgia motorcycle accident injury lawyers at Van Sant Law, as soon as possible. We are dedicated to helping you recover from your injuries by helping you receive the justice and support you need. We can deal with the insurance companies to get you the settlement you deserve. If you have more questions about your specific case, you can contact our office at any time. Let our experienced Georgia motorcycle crash attorneys go to work for you and aggressively use our knowledge to get the best possible outcome in your case. Fill out our online contact form, or call (404) 991-5950 today for a free, no-obligation case evaluation.